Fill your blender 3/4 full with diced watermelon (without the rind, of course). Add water until just below the top of the watermelon. 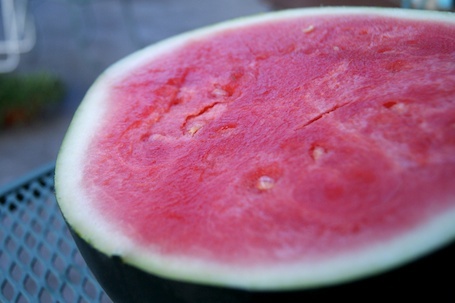 Blend for 1-2 minutes, longer if your watermelon has a lot of seeds. Turn off blender and let it sit for a few minutes to allow the seeds to sink to the bottom. 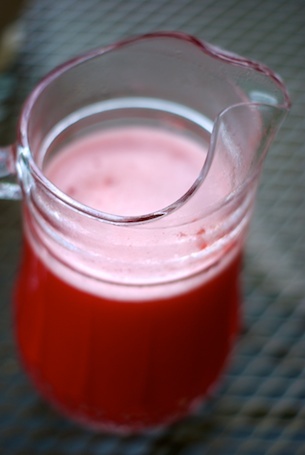 Pour your agua de sandia into a pitcher. If you wish, you can add more water depending on the consistency you desire. Some recipes call for sugar, but none of our watermelons have needed this addition. They also make for delicious paletas, but more on that soon. Enjoy! This entry was posted on August 21, 2011, 5:00 pm and is filed under Recipe. You can follow any responses to this entry through RSS 2.0. You can leave a response, or trackback from your own site. This sounds delicious! Lily recently asked if there was such a thing as “watermelon juice”. It would also be a good solution for watermelon that is slightly over ripe.